Heat oven to 400°F. Line baking sheet with foil; place in oven. Prepare pie crusts as directed on box for Two-Crust Pie using 9-inch glass pie plate. In large bowl, beat cream cheese, 1/2 cup granulated sugar, the vanilla and almond extract with electric mixer on high speed until smooth. Beat in eggs, scraping bowl occasionally. Pour into crust-lined plate. In another large bowl, toss apples and lemon juice to coat; stir in brown sugar, cornstarch and 1 1/2 teaspoons cinnamon. Spoon apple mixture over cream cheese mixture. Unroll second crust on lightly floured work surface. With 2- to 2 1/2-inch apple-shaped cookie cutter, cut out apple shapes. Reroll scraps and cut out additional apple shapes. Using pancake turner, gently arrange apple shapes on top of pie to cover most of filling. In small bowl, beat egg white and water until blended. Brush over apple shapes. In another small bowl, mix 1 teaspoon granulated sugar and 1/2 teaspoon cinnamon; sprinkle over apple shapes. Place pie on foil-lined baking sheet in oven. Cover pie with sheet of foil to prevent excessive browning; bake 20 minutes. Remove foil; bake 20 to 25 minutes longer or until crust is golden brown. Cool on wire rack; refrigerate at least 6 hours or overnight. Serve cold. Store covered in refrigerator. Kim Wroten of Walkersville, Maryland, won 1st Place with this recipe at the Pillsbury Refrigerated Pie Crusts Pie Baking Championship, 2009 Maryland State Fair. 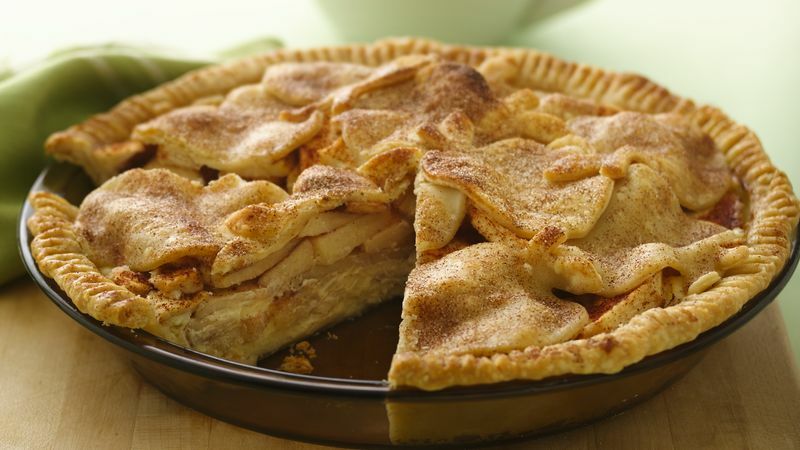 This pie can be made with a traditional lattice top crust in lieu of the apple-shape cut-outs, if preferred.